Vegan education is the most effective thing you can do to help animals. What better way to end animal suffering than to stop eating them? When one person becomes vegan, hundreds of animals’ lives are saved completely. This creates the total end to suffering for the animals involved. Depending on which statistical model you prefer, the number of animals a vegan saves ranges between 85 and over 400 every year, when you include the animals who die as a result of stock farming even before they reach someone’s plate. Elated engages in non-confrontational, grassroots activism. Hosting a vegan information table is one of the most uplifting things you can do. People are clamouring for information on a compassionate lifestyle. 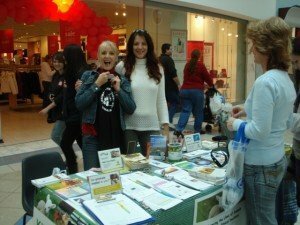 It is a distinctly positive experience to be part of the global vegan education movement, which is entirely altruistic, benefiting animals, people and our beautiful planet. Focus on the victims, that is: the farm animals. Our core mission is to abolish the exploitation of animals. The way we achieve this goal is to help people go vegan. However, the number 1 problem we face with liberating animals is that animals are currently classified as property. Our first step when engaging with anyone about veganism should be to awaken them to the sentience of animals and the injustice of using animals as our resources. We need to help them see why we should care about farm animals. Find common ground with the person you are talking to. Do they have a beloved pet? Have they ever met a farm animal? Explain how all animals are sentient. They all have the same capacity to develop bonds with humans; and they all feel emotional and physical joy and pain. Then describe the truth about animal agriculture and the suffering involved. You will need to debunk the ‘humane myth‘ and emphasise that it is not the treatment of the animals who is the issue, it is the injustice. As sentient beings, all animals have rights: to life, to autonomy over their life and to bodily integrity. Any violation of these rights causes suffering and constitutes injustice. All slaughter is a tragic violation of an animal’s right to life. There is so much information available to help people transition to a vegan lifestyle. Contrary to public opinion, it really is easy to be vegan. Upon discovering the truth behind animal products, many people experience a paradigm shift that totally removes animals from their list of meal options. Changes in awareness occur during one-on-one interactions. By engaging in non-confrontational discussion, we can change the world one heart at a time. We need to always be willing to learn as well as impart knowledge. You will be amazed at how many positive people you meet at the table — save your energy for them. Let the confrontational people go on their way. Do not harass or argue with passersbys: it is counterproductive to get into arguments with omnivores and may result in you being asked to leave or denied future bookings at that venue. You are not expected to have all the answers. In fact it is far more productive not to enter into a debate. Direct people’s attention to the relevant pamphlet when they have specific questions. Ask them to read the literature, or watch a dvd and then contact you if they need further information. Often you will meet the same person a few weeks in a row; the first time they might refuse to even look anywhere near the table; the next time they might take a pamphlet, but refuse to interact; then the third time they will stop and chat, asking tons of questions and honestly engaging. This is real, raw emotion, the stuff life is made of. A man once laughingly told us how there are never any vegan burger patties left over for him at a braai, because his friends eat them all. Only a month before, he had refused to give eye contact and was quite hostile when offered a pamphlet. What a remarkable transformation! Discussing veganism with non-vegans can be difficult at times. Professor Gary L Francione has formulated the following five principles to keep in mind for your next encounter. People are good at heart; they care about morality. Don’t get defensive; respond, don’t react. Don’t get frustrated. Treat every question as if you are hearing it for the very first time and sincerely engage with the person. Learn the basics. You need to be a student first, before you become a teacher. A teacher had just finished writing a module on ‘sustainable’ food that morning. However, after seeing our pamphlets, she said she was going to re-write it! Another man talked about how he went vegetarian 15 years ago after having to run a marketing campaign for an animal product manufacturer. He said that after seeing all the absolutely disgusting horror, he refused to run the campaign, resigned, and never ate animals again. He said that he was thinking about going vegan just the week before and that it was perfect timing to see the Elated stand that day. So why don’t YOU turn off the TV, get up off the couch, get out there and help spread the vegan message? Taking part in vegan education and leafletting is the most fulfilling thing you can do to help farm animals. It will be truly rewarding. Find out more about What You Can Do to help animals now. Would you like to help Elated distribute free vegan pamphlets? Please take a look at Elated’s Wish List.